Get cloud-based solution with advanced analytical model patterns that are trained on an insurer’s data. Uncover deep insights into policyholder behaviors, determine churn propensity, and enhance customer engagement increasing retention, cross-sell, and up-sell opportunities. Quickly deploy secure, integrated, scalable insurance applications for decisions makers who need fast access to customer insights for data driven decisions in marketing, sales and service. Enable integration of insights and to support innovation. 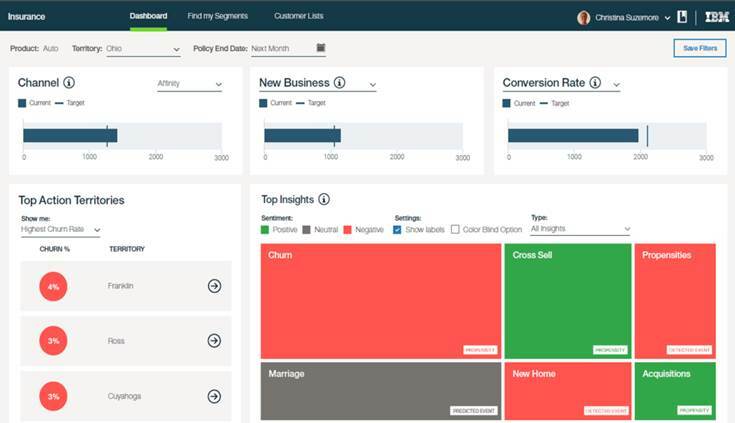 Use advanced analytics with cognitive capabilities to meet the needs of your customer segments at the right time, with the right product, through the right channel, to improve ROI in marketing, boost sales and improve service. Leverage dynamic customer segmentation to create a more personalized policyholder experience based on financial and life events.